I am 23 years old. I have been married for over a year. I cannot count the number of times I hear, "You're married? Already? How old are you?" when people see my ring. I get those looks of pity like they think I truly don't understand what I am got myself into. One time a person started jokingly calling me Jessa Duggar because they thought it was a religious thing that my family had made me court and get married before we could even kiss. Someone asked me once if we had a pre-nup because getting married young ends so often in divorce. To all those people who think we were crazy for getting married young and feel the need to give me these kind of comments, I have a few things to tell you. First, to those who say we don't know what we are got ourselves into, I have been with my soon-to-be husband for almost nine years. That is longer than the average 30-year-old dates before they get married. I know him better than anyone in the world and vice versa. We made it through high school and college together, we have seen each other at our best and worst for years, we have witnessed each other grow and change and are still in love. He is still my favorite person in the world. We did not get married on a whim of young love; it was a long-term relationship and we both have talked about marriage and what we want out of life extensively. We were/are prepared to make this marriage work and last. We are not in this for short term, we are in it for life. We were engaged for two years, which is plenty of time to figure out what we wanted and to make sure marriage was truly what we wanted to do. Just because we are young does not mean we are incapable of making decisions... if we are old enough to chose a career, aren't we old enough to chose a life partner? Second, to those who said I was throwing away my life and I should "find myself" before tying myself to a man, you are so wrong. I did not throw away anything. I gained a person to share my life with and build a beautiful, crazy life with. We travel together, explore together, learn and grow together. Why not experience life with the person you love beside you? Why not have a person there to cheer you up and support you every step of the way? What is so wrong with that? As for needing to "find myself" before settling down; I can find myself and be myself single or married. I know who I am and what I want out of life. So does he and he supports me in everything. Being married isn't a prison sentence, and it does not change your innate character or cause you to shut down. I will still grow and change and he will too. The best part is that we get to do it together and explore every bump, curve and change in the road together. Third, to those who say we should have dated other people to know what we like, I say, "oh well." I didn't know that my now husband would be my first and last kiss. I never planned to only date one person and end up marrying them... But when you meet the right one, there is no reason to throw it away just to play the field a bit. I also saved myself a lot of heartache and bad dates, so no complaints there. I fell in love when I was 15 and I haven't fallen out yet. Many years ago, it was normal to marry your high school sweetheart... and marriages tended to last a lot longer then... so I just don't see a problem with marrying the person you fell in love with no matter how young you may have been. Maybe I am just a romantic at heart, but I believe that sometimes the first is the best. I also bought the first wedding dress I ever tried on so maybe that is just me and well, that is OK.
Fourth, I did not give up anything to marry my love and I will not waste my 20's. I am still going to law school, I will still travel the world, I will still make mistakes and do crazy things and enjoy my 20's. I will just do all of that with my best friend beside me every step of the way. All I see is gaining a partner in everything I do and a support system... no loss there. Lastly, to those that give me the pitying looks, I actually pity you. Feeling the need to look at me that way for doing nothing more than marrying the love of my life when I was 22 is a bit ridiculous. Stop worrying about me and my life and worry about your own a bit more. For hundreds of years, people throughout history got married young and yet had more lasting marriages than we do in today's world. So what is wrong with me doing something that has worked so well in the past? Marriage is great... I come home everyday and hang out with my best friend. I love nothing more than making him a batch of gluten free cookies after a long work day and he wakes up and makes me breakfast every Saturday, We go on vacation and have a blast. We spend Friday nights sitting on the couch watching Disney movies and try to out-quote and out-sing each other. We still go out with friends and get slightly wasted and wild. We make big decisions together and lean on each other when times get a little tough. We parent our furbabies for now and dream about the future... together. Don't get me wrong, we fight, we get annoyed and things aren't always butterflies and sunshine. Marriage takes work... lots and lots of work. Marriage takes so much compromise. You have to put your marriage first. You have to want it every day... basically that scene with Noah and Allie in The Notebook when she is trying to decide to stay or go? That's real life. It's really really hard but it's worth it if you want to spend life with that person. Getting to spend your life with someone you love is a beautiful thing. I am so happy I got married at 22. I have shared the most wonderful year of marriage, love and laughter with my best friend, my soulmate, my husband. Getting married young simply gave us all that many more years to enjoy life together and I simply can't wait. There's really nothing wrong with that. I am a young wife and I am loving every minute... even when that involves dirty boy socks on the floor. 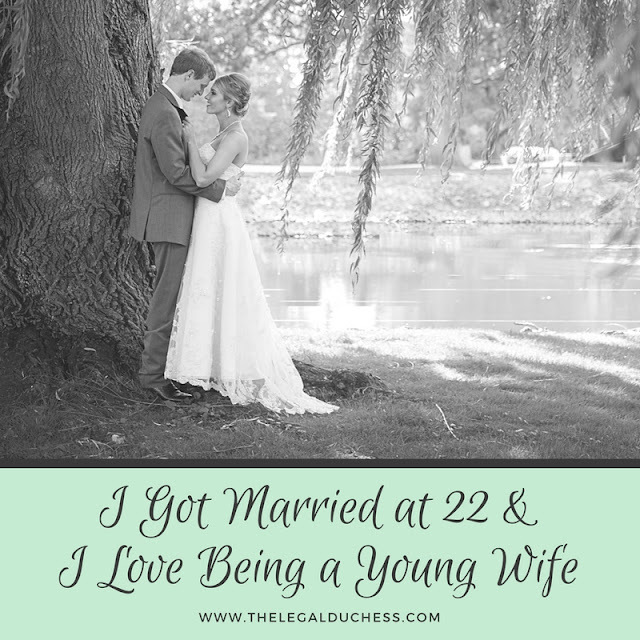 So here's to my sweet, 23 year old husband... I love your red curls, dimples and ability to always make me laugh. Thank you for understanding my need to always carry a to-do list, keeping my sane during law school and enduring my crazy every single day. I will never completely understand why you chose me out of that Freshman communications class but I will forever be grateful that we get to spend this life together. I'm now married to the father of my two kids who i love so much.Before all these sudden happiness took place in my life i went through hell.I dated my husband for 8years with little breakup's between until a whore came into our life who was my best friend.When i discovered my husband was cheating on me with her i was so mad at him that i could not even look at him anymore.As time went on i and my husband was trying to fix things but my best friend wanted us to be apart from each other in other to have him to herself which she later achieved.Soon my husband wasn't paying attention to me anymore.All he could think of was how he could dump me and his two beautiful kids in other to be with my best friend.I was so heart broken because i loved him so much i tried all means to get him back but it wasn't possible.After a long while of unhappiness i meant a spell caster on-line whose name is dr Noruwa, i explained my problem to him and he demanded for some materials to prepare a spell and i proved the materials and since then my life has been transformed from sadness to total happiness. If you have a similar problem he might be the right person to solve your problem so if anyone need his help contact him via d DRNORUWASPELLHOME@GMAIL.COM all your problem will be solve.